Ladies!!! I'm super excited about today. The guest blogger today happens to be the blogger behind the very first blog I ever started reading. Maybe that's the case for some of you too? Today, Kelly from Kelly's Korner is visiting us and "Claiming Her Crazy"! I absolutely love Kelly! 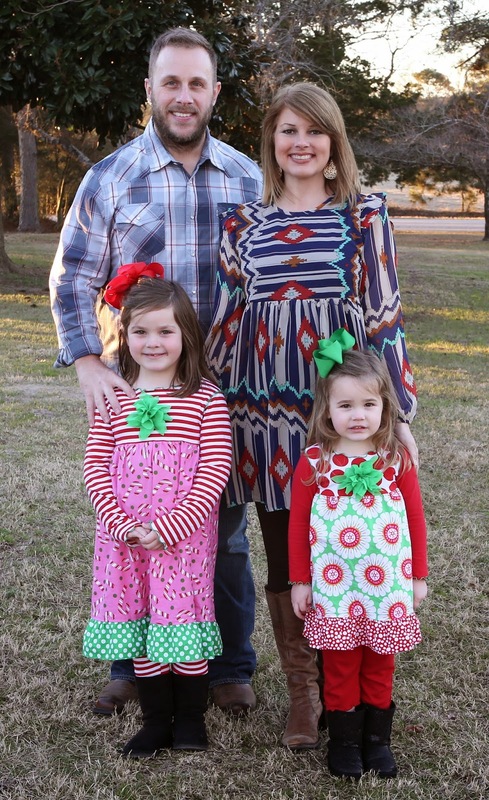 She is a wife, mama to two girls (and soon to be a little boy as well), and a fabulous Christian example of someone living out her life for Christ. When Shay and I went to Nashville in the fall for the Dot Mom Conference, we got to meet Kelly. She was just as sweet in person as I'd imagined her to be. Kelly "owned it" today and is sharing her crazy. 1. I'm terrified of cats. TERRIFIED. I wouldn't touch a cat to save my life. When I was little I thought all cats wanted to eat me. Cats can jump on my lap and I just sit frozen until it gets off. My friends all tease me for my disdain for cats. Kelly, our neighbor a couple houses down has a cat door AND a cat run in the back of her yard. Have you ever heard of that? I hadn't, but you would flip out if you saw a cat just swinging in and out of her cat door!! 2. I have a weirdness about eggs. The thought of eggs makes me gag. Scrambled eggs literally make me want to throw up. And I wouldn't eat an omelet EVER. BUT I really like quiche and deviled eggs. I can't explain. In college, we had "Taco Wednesdays", which meant Taco Bell and the Bachelor. I can get behind some Taco Bell! 4. I wore a lot of terrible 80's/90's clothes. TERRIBLE. And had the biggest hair in Arkansas. I mean - I wore THIS in college. And thought I looked cute. Good news - floral rompers are in style for spring 2015. My husband would say the same thing about me! haha! I have a tendency to just stick my debit card in Bowen's bag or my pocket and then it's gone for ages. We're soul sisters on that crazy. I completely understand. 7. I had a lead foot in college. I got a lot of tickets and took defensive driving three times. I got my last ticket in my mid 20's and ended up having to do HOURS of community service. I had to ride around in the back of a truck with a lot of juvenile delinquents in an orange vest while a police officer took us to service locations. I had a professional job at this point. Needless to say - Scott will be teaching our children to drive. 8. This is my hair my senior year of high school. There is no shadow in this picture - it is ALL my hair. I had a spiral perm and then would hot roll and spray my hair to death and then hold it out and blow the hair dryer to make it stand up. 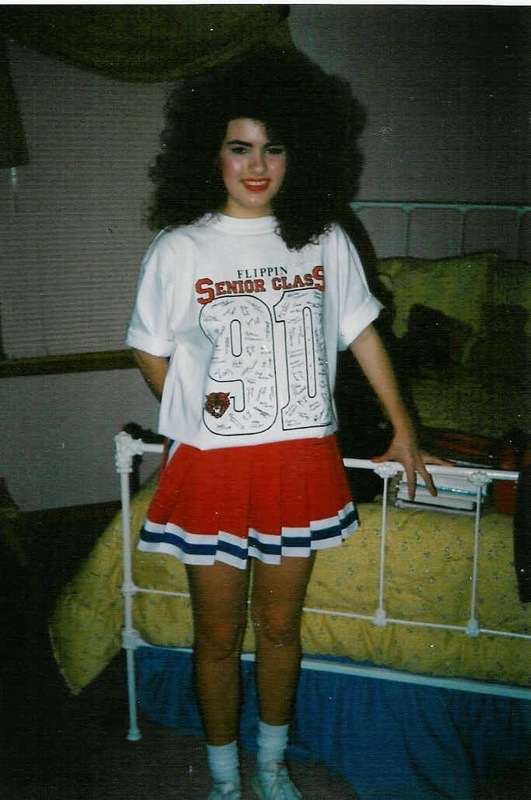 I was a cheerleader so at halftime, I would go to the locker room and put another layer of hair spray on. I went completely gray right after college (thanks to my dad's family genes) and so to cover it - I have been nearly every hair color in the book. I have finally decided I have to stay medium blond because it covers the gray best. There aren't many people who can pull off blond and brunette, but you do it with flying colors!! 10. In the 8th grade I wore braces and HEAD GEAR. (This was the day I got my braces). I also wore those awful thick glasses that had Lucy from the Peanuts gang on the side. Kids called me Lucy for years. I had to wear that awful head gear all the time unless I was eating or cheerleading. Bless my heart. Bless my mom's heart that we have NO pictures of that head gear. I was the definition of Awkward. So basically I'm owning that I'm a BIG nerd. But I'm a happy one who loves to make fun of herself! Don't forget to check out Kelly's blog here. I love this series. It makes me feel my crazy is okay. Kelly is the first blog I ever read too! Kelly, first of all, let's be mad at Erika for the fact that she watched The Bachelor IN COLLEGE. What? Secondly, you love Taco Bell, but I am a Taco Bueno gal. Mexi Dips and Chips are THE BOMB. Third, you saying "that's not a shadow - that's all my hair"....HILARIOUS. Finally, I had headgear too. I had to wear something called a Herbst device that looked like a clear football mouthpiece. AND I had to wear a chin cup at night that rubbed a balled spot on my head. Awesome. So fun to read this today! 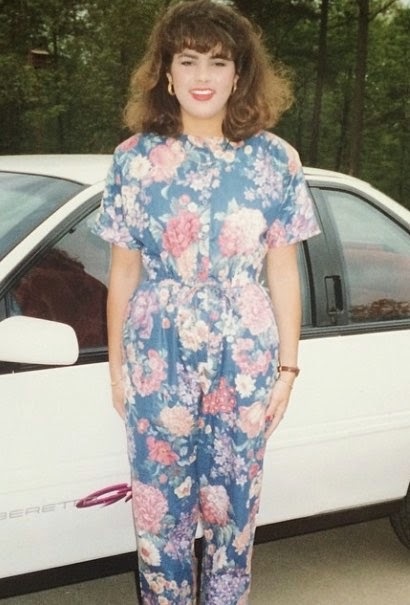 Oh gosh-- your hair in high school! Such volume!! Great post, Kelly!! So funny! Oh my goodness, I've never seen hair that big! I didn't know that was possible! My hair is as flat as can be so I'm a bit envious..ha! Kelly is as beautiful on the inside as she is on the outside. Her blog is always so real. That is the biggest hair, I have ever seen! Love Kelly! While my hair wasn't that big, it does take me back to my middle school days! lol! Loved that cheerleading photo!!! This was hilarious! I love Kelly and her blog. I, too, hated blue jeans as a child, I didn't wear them until middle school. I only wore dresses FOREVER, even in the dead of winter and refused to wear tights. My mom would try to dress me in my sleep, and I can still remember the feeling of pants going on my legs waking me up in horror. LOL. Now I wear jeans every single day. Go figure. Ha ha I'm so crazy to share my crazy!!! But it was fun! And if anyone has an 80's party and needs me to make your hair big - I'm yours! 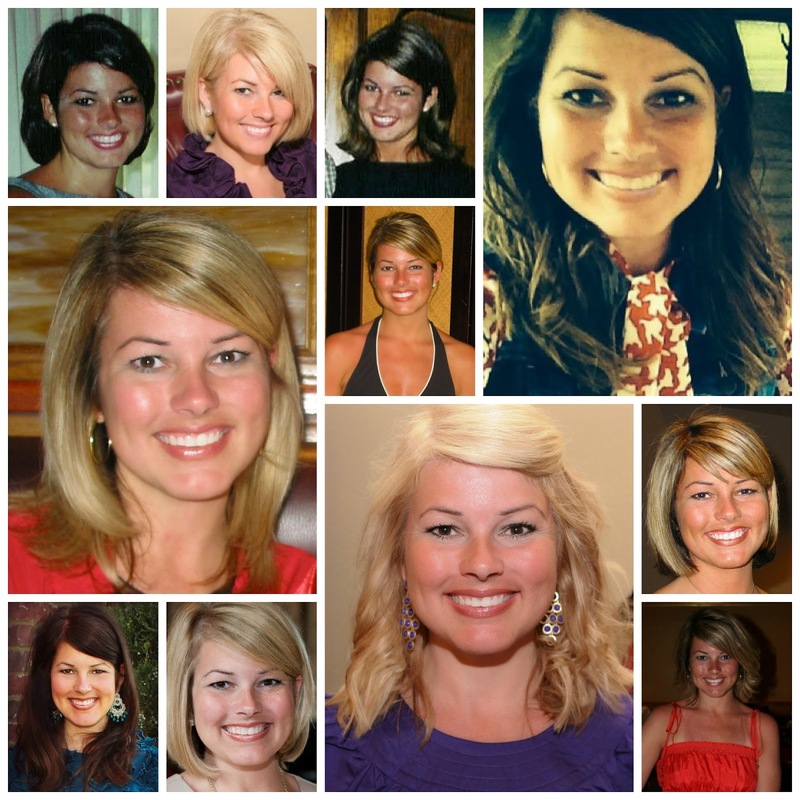 Love Kelly's blog & love her crazy! :) And that high school hair? Wow! I kept looking thinking there had to be a shadow! That's some good hairspray! I love this and Kelly, I love your hair! You girls are too funny! Sheaffer...I thought the same exact thing about Erika watching The Bachelor during college. I was already married for 10 years and had 2 kids when it started. Sigh. Kelly's hair was the epitome of what all of us 80's teens strove for. It truly was a masterpiece. I can remember in high school bringing my mini curling iron (it ran off of butane) to school to touch up in between classes or after gym or just because it was always raining (I lived in England). The amount of aqua net that was consumed by one of my friends alone had to cause some ozone issues. I also wore aqua and hot pink colored mascara. Kelly does look great in any color and that is very unusual. Love her and her blog! Jeans hater right here, too! I showed livestock growing up and HAD to wear jeans to show, it was terrible, but from the time I was a little girl I've preferred dresses or long shirts and tights or leggings! Kelly's blog was my first blog too! I started reading right after Harper was born. I LOVE how she lives her life for Christ while keepin' it real! Love me some Taco Bell and Sonic too! I love this!!! The hair is so funny!! Erika- please have Sheaffer share her crazy. I could see LOTS of laughs with that. She's hilarious. I love this owning series!! Kellys blog is one of the first I came across when I started blogging as well. Love this post! Kelly, didn't Laurie recently get a cat?! Has this taken a toll on your friendship? Just kidding. 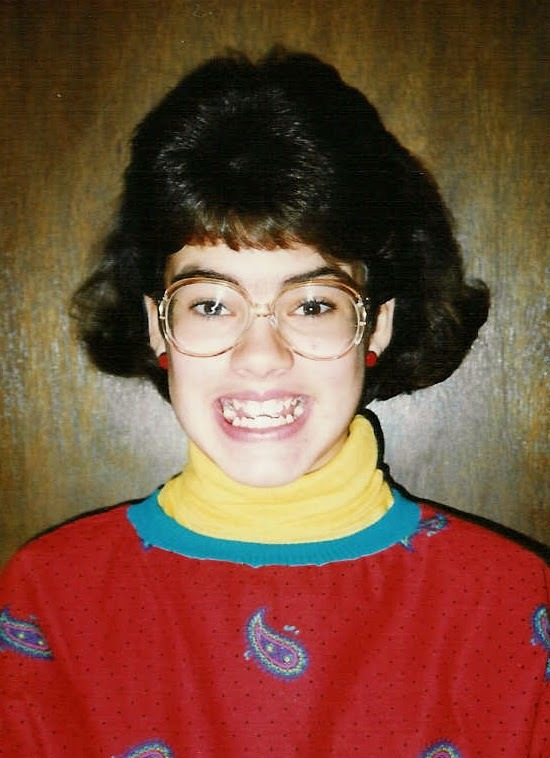 Oh my goodness the big hair and big glasses and total awkwardness looks way, way too familiar!! Kelly's blog is the first I started reading too. Love her! Oh my goodness, this was so fun to read! I even went back and read the other "owning it" posts and laughed out loud because I can SO relate to so many of them. :) Good to know I'm not alone in my craziness. What a fun series! Love this!!!! Kelly was my first blog too and inspired me to start my own (and someone please inspire me to start again;;;). We had bachelor nights in college too!!! I remember watching the first season finale at Greg's house. I love Kelly's blog, and it was the first blog I started reading too. Not sure how I even came across it up here in MI..... Didn't even know what a blog was back then ... Ha! When did the Bachelor premiere?